Last weekend, we hosted an impromptu football party. Food wise, I wanted to keep things simple. I wanted to serve finger foods and dishes that didn't require a lot of effort to put together or clean up after. 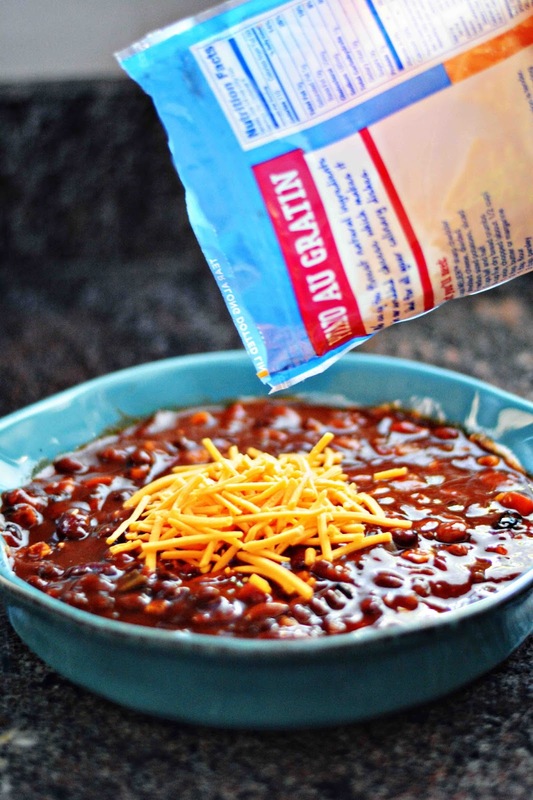 I was really wanting a chili cheese dip, but spending a lot of time in the kitchen preparing the chili just wasn't meshing with my quick and easy plans. But, inspiration hit as I was browsing the soup aisle of the store and came across new Progresso Chili! I purchased the New Progresso Roasted Vegetable Chili with 3 Beans, which is a meat-free option that includes tomatoes, carrots, roasted corn, red and green bell and poblano peppers and onions; and pinto, black and dark red kidney beans. I brought it home to whip up a quick and easy 3 ingredient dip that had my game day guests raving about its deliciousness! Best of all, it was put together and ready to be served in under 15 minutes! 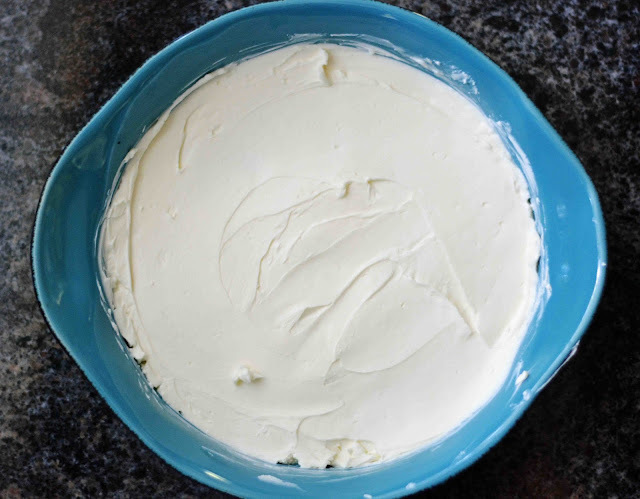 Start the first layer by spreading the cream cheese on the bottom of baking dish. Next, add the Progresso Chili on top of the cream cheese. Top the first two layers with the cheddar cheese. Bake in the preheated oven for 10 minutes, or until cheese is completely melted. *If desired, garnish with sour cream and chives. Head to the Progresso Game Day Recipes page to find additional chili recipes for your game day needs! While you're there, check out the delicious stew that Progresso has also added to their portfolio! 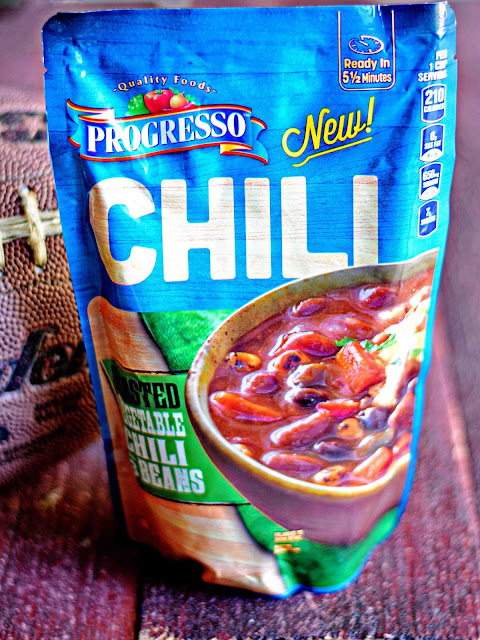 Snag a $1 off 3 Progresso Coupon and and make Progresso a staple in your game day grub! Stay up to date on new products and promotions by following along with Progresso on Facebook. One lucky Theresa's Mixed Nuts reader is going to win a Progresso prize package featuring Progresso’s new Chili and Stew flavors, Progresso Ladle and a Game Day Cooler Chair, which is a $25 value! *The giveaway is open to residents of the U.S., 13+. No PO Boxes will be accepted. The giveaway will run through 10/16/15. Winner will have 48 hours to respond to winning email before a new winner is selected. *All entries are verified, so please make sure you are properly entering for the entries you claim. Please enter on the Giveaway Tools widget below. I love dips like this. We always make stuff like this for the Pats games! I bet you do Robin! Dip and football just seem to go hand in hand! This looks great! It's perfect for football season, or Halloween parties. I didn't even think to serve this at our Halloween party. Great idea, Alissa! OMG that melted cheese on top looks so naughty! We have mostly hardwood, so no messy spills here thankfully! We're supposed to be on a diet, Dezzmeister! 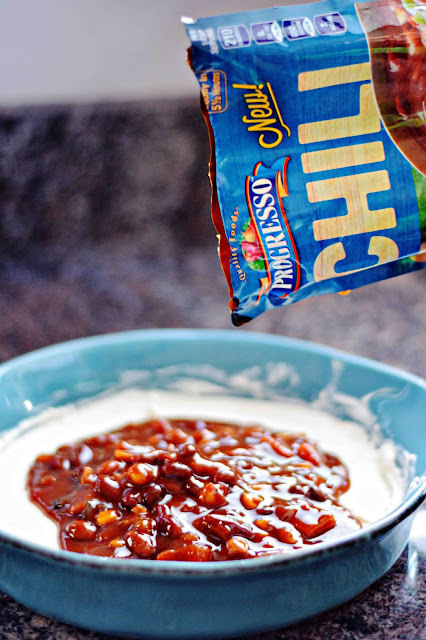 I want to try the Chili Tachos....they look bad but OH SO good! I would really like to try the Chicken chili nachos recipe. I would like to try the Chili Tachos recipe. The chili tachos looks delicious! We may have to take them tailgating at our next home football game! The Chicken stew biscuit cups look good. I'd absolutely love to try the Chicken Chili Nachos! The Chicken Stew Biscuit Cups sound amazing. I don't think I'd want to share! Chicken Chili Nachos sounds delicious to me, and it doesn't look hard to make, either! The pulled chicken sandwiches recipe looks good to me. I love quick and easy recipes - that looks like one I will definitely use in the future, and I will be checking the website often for quick ideas. I would like to try the chicken stew biscuits. so yummy! The recipe for chili tachos sound interesting. The chicken chilli nachos look like the best game day recipe. 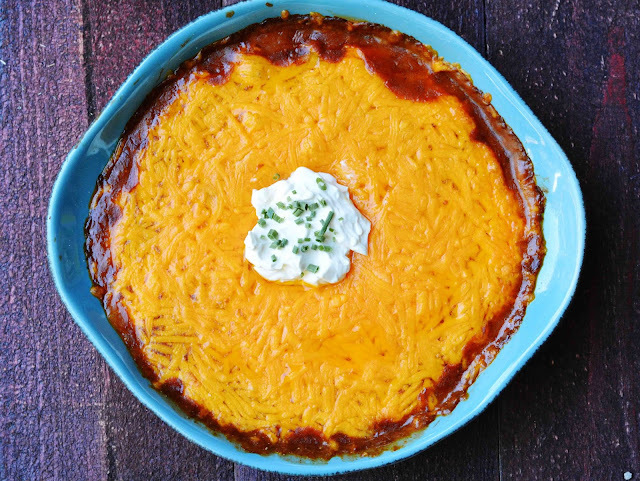 Oh the EASY BUFFALO CHICKEN CHILI DIP looks so good to me! My family would love that! I would love to try the CHICKEN CHILI NACHOS recipe. The CHICKEN STEW BISCUIT CUPS would be a big hit with my gang. Neat idea! The Chicken Stew Biscuit Cups look really good! I am excited to try the Chicken Chili Nachos recipes. Thanks! 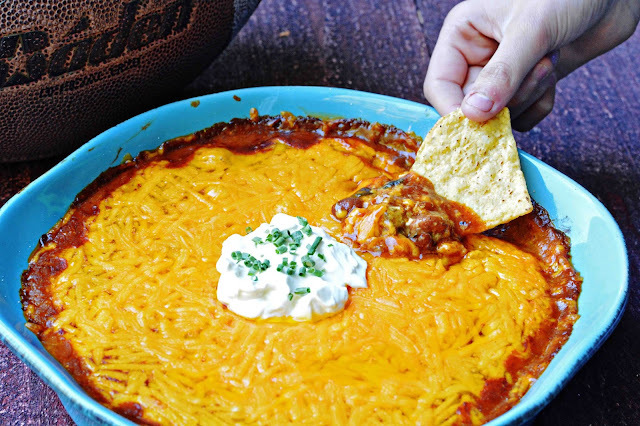 I would love to have that Easy Buffalo Chicken Chili Dip while watching my game. The Chili Tachos sound really good. Can't go wrong with tater tots, and it looks easy to make. I think the Chicken Stew Biscuit Cups look yummy. The recipe that is appealing to me is The Chicken Stew Biscuit Cups!!! My kids would love them and the seem easy to make!! I would like to try the Chicken Parmesan Tuscany. The Chicken Chili Nachos look so appealing. I have never had chicken nachos before so these would really be a treat. PUB FRIES WITH BEEF STEW sounds delicious to me! Chicken chili nachos look good to me! The whole family would love it! I would love to give the Easy Buffalo Chicken Chili Dip a try! It looks like it would be good and everyone loves a little spice! I like the chicken chili nachos. We are not big beef eaters in our home, so this would be great. I would love to try the chicken stew biscuit cups. They seem easy to make and super yummy! I would love to make the Chicken Stew Biscuit Cups!